Town of Wasaga Beach (Lower Tier Simcoe)Record Owner? Log in. The name is from Nottawasaga, derived from the First Nations Peoples word for 'outlet ofIroquois river.' At the mouth of the river is Nancy I., formed by the wreck of the schooner Nancy. Originally a trading ship of the North West Company, it was commandeered by the British Navy during the War of 1812 and outfItted for war. In 1913, during a naval battle with three American ships, the Nancy sought refuge in the Nottawasaga R., but ran aground and burned. Silt and sand built up around the charred hulk and formed a small island. In 1925 what remained of the hull was dug up and put on display in an environmentally-controlled chamber. A museum depicts events of the War of 1812 and displays artifacts recovered from the Nancy. The population ofWasaga Beach multiplies many times over in summer, when holidayers flock to its 14-km-Iong sandy beach. 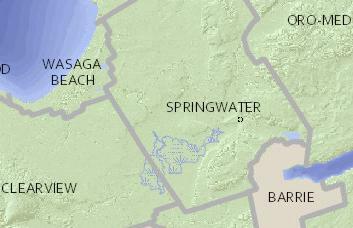 Have something to say about Town of Wasaga Beach (Lower Tier Simcoe)?